A shellac finish has been used by woodworkers since the early 1800’s. It has many advantages: shellac is non-toxic, can be used as a sealer before applying a stain (to even out the stain’s application), can be mixed with nearly any color, and is very easy to repair in the event of damage from use. That being said, there are some drawbacks to using shellac as a final wood finish. Shellac does not hold up well to heat or water, and it dries very quickly when being applied, which leads many woodworkers to believe that applying a proper shellac finish can be difficult. While many techniques for padding are used, a favorite that I recently learned is to wrap a ten-inch square piece of muslin around an old (clean) athletic sock. 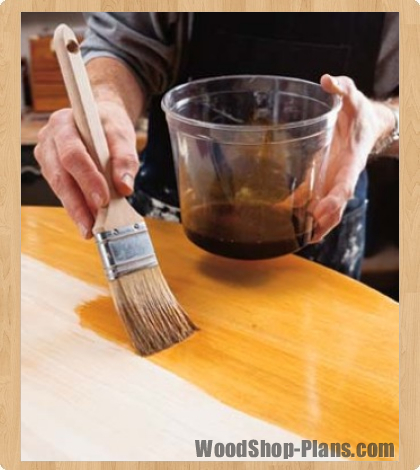 Before beginning to apply the shellac, place your cut of shellac into a squeeze bottle. Squeeze a liberal amount of shellac into the sock to act as a reservoir. Then wrap the muslin around the sock and hold the edges of the muslin behind the sock. Once the pad is on the wood, work in somewhat irregular patterns rather than just with the grain. This will insure a thorough coverage. As you need more shellac, simply squeeze the pad a bit. A more traditional method of padding is to fold a piece of muslin a few times so you have a flat pad with a few layers of thickness. Then apply light coats of shellac with a moist, but not dripping wet pad. No matter which method of padding you choose, you’ll find padding works best on flat surfaces. Irregular areas, corners and trim will likely be easier to apply with a brush.